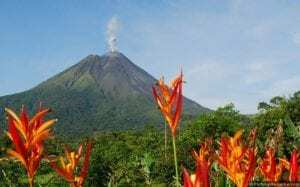 The Arenal volcano is 1,635 meters high. It’s bordered by dense rain forest and natural hot springs. On the way up to the Volcano, you will enjoy gorgeous views of the forest, waterfalls and the typical Costa Rican towns. At the base of the volcano you’ll find a number of natural hot springs, while taking advantage of the beautiful resort grounds, where you can enjoy one of the most relaxing experiences of your life. The volcano rests near the town of La Fortuna where you will find several restaurants, boutique stores and souvenir shops. Location: North Jaco Area, around 4 hours driving. Includes: A/C transportation, bilingual guide, entrance fee to hot springs, visit to the Lake, breakfast and lunch. What to Bring: Comfortable clothes, jacket, swimming suit, walking shoes, hat, camera and sun block.